I am now convinced that the quartet offer the current value and that they will be at least Top 3. Youtube is excellent for analysing popularity and below are the results from searches looking at the number of videos uploaded. Blue is in the last month and red is in the last week. The ratio of red over blue is virtually identical for all the contestants - 0.40 to 0.42 - which shows by my reckoning little momentum change for anyone. As you can see they are second only to Diana Vickers at the moment with a significant gap to third place. They are also building up steam on the Google Trends charts and are actually catching Diana in that respect. There is a massive gap for a boyband in the UK at the moment and other than Diana, they offer the possibility of making long term money for Mr Cowell. 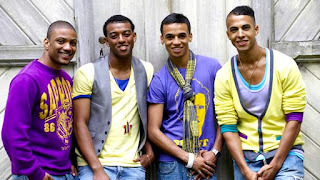 I know a band have never won X Factor but they have come close. They have also tightened up their performances in the last 2 weeks and are now playing to their strengths. I have moved position from Eoghan (netting a small profit) to these guys. In case you are wondering, I am also on Diana at 8/1, Rachel 19/1(Doh!) and have a little on Daniel as insurance against Same Differenceitis. It is also interesting to see who is not popular. Daniel cannot be properly analysed by these methods in my opinion as his voting cohort are older and are not on Youtube (beware he was also backed by Chris Moyles). He worries me from a betting view. It has also empathised my belief that Alexandra is not popular. The fact that it is Mariah Carey week makes things more tricky as it should aid Alexandra and Rachel. My advice. Wait until the running order is known before betting tonight. I still think Alexandra and Rachel for bottom two could be good value if they are up early but I am betting small this week as it is hard to read. EDIT: Diana is apparently not singing tonight due to Laryngitis. would be nice to get an idea of comparative momentum of jls and diana. See the change on the graph. Using monthly v weekly data you can theoretically extrapolate momentum. I will try to collect it from now on. Joe Swash: To back or not to back? This would be nice on your desktop! I'm A Celebrity, Get Me Out Of Here! Is the X Factor a number? John Sergeant: Another Christopher Parker?